Janchi guksu is a Korean noodle dish consisting of wheat flour noodles in a light broth made from anchovy and sometimes also dasima (kombu). Beef broth may be substituted for the anchovy broth. It is served with a sauce made from sesame oil, ganjang, and small amounts of chili pepper powder and scallions. Thinly sliced jidan (지단, fried egg), gim (laver), and zucchini are added on top of the dish as garnishes. The name derives from the Korean word janchi (잔치, literally "feast" or "banquet"), because the noodle dish has been eaten for special occasions like wedding feasts, birthday parties, or hwangap (60th birthday celebration) throughout Korea. The word guksu means "noodles" in Korean, and noodles symbolise longevity - in life, in a marriage. Because the noodles are traditionally eaten at weddings, the expression "When are you going to feed us guksu?" is a way of asking "When are you going to get married?" and a wedding day might be referred as "a day to eat guksu". ↑ Lee Seong-hui (이성희). "Janchi guksu, blessing for longevity (장수를 기원하는 '잔치국수)" (in Korean). dtnews24. 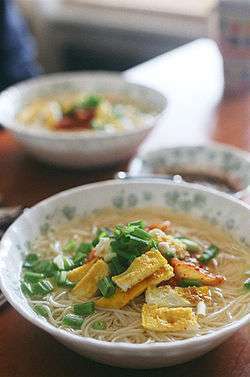 Wikimedia Commons has media related to Janchi guksu.